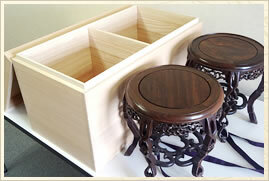 Hand made paulownia wooden boxes to your exact specifications. 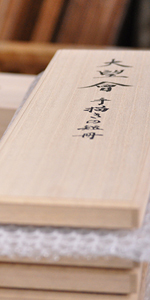 Production and sales of paulownia wooden boxes. wooden boxes one by one with their soul. practiced ever since Edo period. truly reflects the beauty and heart of Japan. North America to pursue the beauty and high quality. 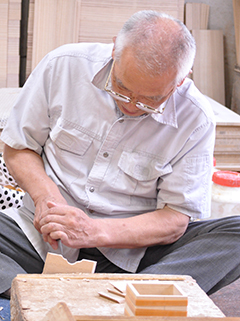 See how our craftsman makes our boxes. kimono sent to Jonny Depp. Consulate-General on the occasion of returning home. appointed with the Japanese Royal Warrant. by a living national treasure. suited to keep clothes, art works, jewelries, etc. and renders durability that lasts many years. Paulownia wood is the lightest domestic wood. 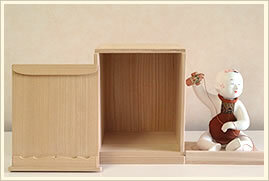 If a box needs to be made, a paulownia box is lighter and more conveniently portable. Dried paulownia wood hardly shrinks. It provides an airtight product. climate such as temperature and humidity. and low humidity by absorbing and releasing moisture. This capacity is considered to be higher in a material that is softer and has a smaller specific gravity. Maintaining a constant humidity is an important condition to store an item. Paulownia is flame retardant and almost smoke free. pocket hand warmers. Paulownia has a non-heat conductive structure and hardly cracks when heated. It is often said that clothes stored in a paulownia chest drawer were safe even if left in a fire. 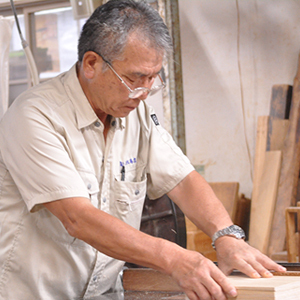 Copyright(c) PAULOWNIA WOODEN BOX FACTORY by Soichiro Kobayashi All Rights Reserved.